Have you ever wondered what it would be like to walk a mile (or 1.6 kilometres) in somebody else’s shoes? Or have you ever tried to send a telepathic message to a partner in transit to “pick up milk on your way home”? Recent advances in brain-computer interfaces are turning the science fantasy of transmitting thoughts directly from one brain to another into reality. Studies published in the last two years have reported direct transmission of brain activity between two animals, between two humans and even between a human and a rat. These “brain-to-brain interfaces” (BBIs) allow for direct transmission of brain activity in real time by coupling the brains of two individuals. So what is the science behind this? Brain-to-brain interface is made possible because of the way brain cells communicate with each other. Cell-to-cell communication occurs via a process known as synaptic transmission, where chemical signals are passed between cells resulting in electrical spikes in the receiving cell. Synaptic transmission forms the basis of all brain activity, including motor control, memory, perception and emotion. Because cells are connected in a network, brain activity produces a synchronised pulse of electrical activity, which is called a “brain wave”. Brain waves change according to the cognitive processes that the brain is currently working through and are characterised by the time-frequency pattern of the up and down states (oscillations). For example, there are brainwaves that are characteristic of the different phases of sleep, and patterns characteristic of various states of awareness and consciousness. 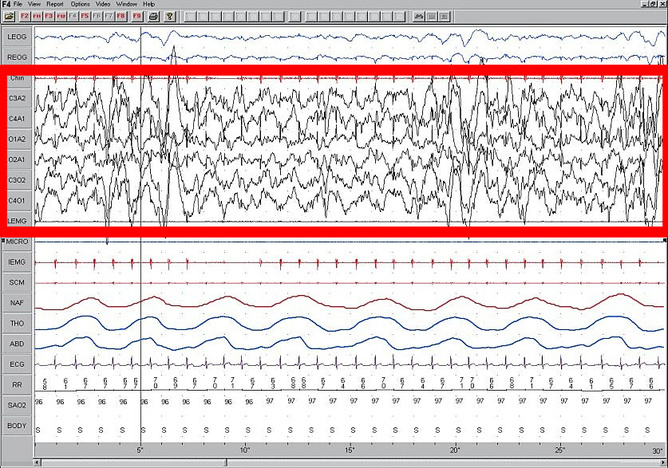 An example of brainwaves that appear during one of the stages of sleep. Brainwaves are detected using a technique known as electroencephalography (EEG), where a swimming-cap like device is worn over the scalp and electrical activity detected via electrodes. The pattern of activity is then recorded and interpreted using computer software. This kind of brain-machine interface forms the basis of neural prosthesis technology and is used to restore brain function. This may sound far-fetched, but neural prostheses are actually commonplace, just think of the Cochlear implant! The electrical nature of the brain allows not only for sending of signals, but also for the receiving of electrical pulses. These can be delivered in a non-invasive way using a technique called transcranial magnetic stimulation (TMS). A TMS device creates a magnetic field over the scalp, which then causes an electrical current in the brain. When a TMS coil is placed over the motor cortex, the motor pathways can be activated, resulting in movement of a limb, hand or foot, or even a finger or toe. Scientists are now working on ways to sort through all the noise in brainwaves to uncover specific signals that can then be used to create an artificial communication channel between animals. The first demonstration of this was in a 2013 study where a pair of rats were connected through a BBI to perform a behavioural task. The connection was reinforced by giving both rats a reward when the receiver rat performed the task correctly. Hot on the heels of this study was a demonstration that a human could control the tail movements of a rat via BBI. We now know that BBIs can work between humans too. By combining EEG and TMS, scientists have transmitted the thought of moving a hand from one person to a separate individual, who actually moved their hand. The BBI works best when both participants are conscious cooperators in the experiment. In this case, the subjects were engaged in a computer game. The latest advance in human BBIs represents another leap forward. This is where transmission of conscious thought was achieved between two human beings in August last year. Using a combination of technologies – including EEG, the Internet and TMS – the team of researchers was able to transmit a thought all the way from India to France. Words were first coded into binary notation (i.e. 1 = “hola”; 0 = “ciao”). Then the resulting EEG signal from the person thinking the 1 or the 0 was transmitted to a robot-driven TMS device positioned over the visual cortex of the receiver’s brain. In this case, the TMS pulses resulted in the perception of flashes of light for the receiver, who was then able to decode this information into the original words (hola or ciao). Now that these BBI technologies are becoming a reality, they have a huge potential to impact the way we interact with other humans. And maybe even the way we communicate with animals through direct transmission of thought. Such technologies have obvious ethical and legal implications, however. So it is important to note that the success of BBIs depends upon the conscious coupling of the subjects. In this respect, there is a terrific potential for BBIs to one day be integrated into psychotherapies, including cognitive behavioural therapy, learning of motor skills, or even more fantastical situations akin to remote control of robots on distant planets or Vulcan-like mind melds a la Star Trek. Soon, it might well be possible to really experience walking a mile (or a kilometre) in another person’s shoes.